I wasn't exactly sure what to expect judging from the cover of "My Own Army" cover and the band's name. 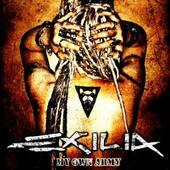 Well, Exilia hails from Italy and play nu-metal similar to Disturbed. Frankly, they are more loud than heavy. The metal elements in the music are few and either bland, generic or both. They occasionally hit a few moments at the start of a few songs, but they quickly wipe away most of the potential in favor of time-wasting drivel. Many of the songs tend to bleed together as the guitar tones are largely the same and the rhythm section plays very standard and uninspired bits for each track. Their goal seems to be to cover up their lack of ideas with sheer volume. That's kind of like the cat covering up its poop with kitty litter. It works for a little while, but eventually the stink comes to the surface. The one saving grace for this band are the vocals of Masha Mismane. She shines even amidst the mediocre material she has to work with. Her voice is both aggressive, harsh and melodic depending on the mood. She is the sole reason I was able to make it through this album without hitting the stop button once. My attention was really fading fast on many songs, but the vocals kept me in there until the end. I actually think Mismane would be better suited to work with an act where the music could compliment her talents to an extent that she deserves. For more information, check out http://www.myspace.com/exilia.